I love to bake for my family. So much so that several years ago I started a tradition of making homemade muffins every Saturday morning. Aside from a few rare weekends I’ve pretty much kept that tradition alive, but since there are only so many different kinds of muffins they like, every now and then I like to change things up a little bit. 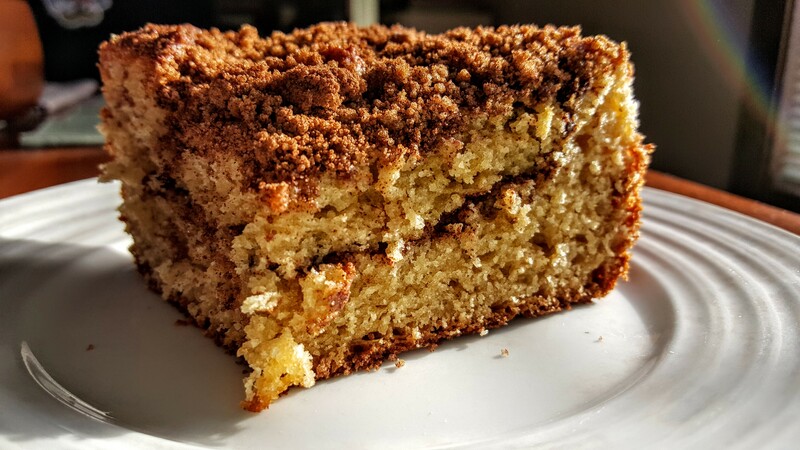 One of my absolute favorite breakfast treats is coffee cake and I finally think I’ve pretty much perfected it by creating something that is moist, yummy, and maybe even a tiny bit healthy. Maybe. I guess you can be the judge of that, but mostly I hope you find this recipe to be just as delicious as my family and I do, especially with a cup of coffee. No, really. Coffee cake really does go so nicely with coffee. They are like a perfect match. Kind of like peanut butter and jelly or peas and carrots or maybe milk and cookies. Personally I don’t even care what I drink with my coffee cake as long as I can have a big slice (or three) over the course of the weekend. But mostly I love to enjoy it with coffee. I said that already though, didn’t I? Sorry. Me and my one-track coffee with coffee cake mind lost focus for a minute there. I should probably just share the recipe with you and stop rambling on about it because if there is any possible way for you to make it for your family this weekend I want that to happen. Because I’m a giver. And I love you. And your family. Okay, here you go. *Combine in a small bowl and set aside. Grease an 8 1/2 – 9 inch cake pan. Combine the flour(s) and baking powder in a medium bowl and set aside. In a large bowl, combine the butter and sugar, and mix until creamy. Add in the Greek yogurt and keep on mixing. Splash in the vanilla and mix until incorporated. Gradually add in the flour mixture and mix until fully combined. Add 1/2 of the cake batter to the pan and sprinkle 1/2 of the topping mixture over the batter. Carefully spoon the rest of the batter into the pan and sprinkle with remainder of topping. Bake for 40-45 minutes, depending on size of your pan, and use a toothpick to check for doneness. By this time your kitchen should smell amazing and you should easily be on your second cup of coffee. Remove the coffee cake from the oven, allow to sit for 10-15 minutes, slice and enjoy every last cinnamony bite. P.S. This coffee cake is just as good the second day. I warm a slice in the microwave for about 20 seconds and basically enjoy it the same way I did the first day. With a big, hot cup of coffee. P.P.S. I hope you and your family love this as much as I do and just remember, it’s healthy coffee cake because there’s wheat flour and Greek yogurt in the ingredients, so if you eat half of it all by yourself (maybe like I did) then there’s absolutely nothing to feel guilty about. I love coffee cake, and I love having it as a brunch item. Perfect for anytime of the day really. I agree, Gloria, which is why coffee cake can be a little dangerous for me. I could eat ANY time of day. Homemade coffee cake is the BEST. I love it warm right out of the oven. Me too, Robin. A big huge slice right out of the oven. I love a good coffee cake, I’ve never tried to make my own though. I pinned this for later! Ashley @irishred02 recently posted..Valentine’s Day Party! I had never made it myself until pretty recently, Ashley, but it’s SO easy. I hope you try it soon! Wow does that look delicious and heavenly. Looks better than any coffee cake I have ever seen! Enjoy ! Athena recently posted..Are You Ready to Caption It? The Contest Is in Full Swing and the Second Cartoon Has Been Posted. Visit iResolveNow.com to Participate! YUM!! The perfect pairing to my afternoon tea. I am so making this. I have not doubt it would go very nicely with your afternoon, Rebecca. I hope you love it as much as I do! Coffee cake makes for a delicious breakfast item and dessert. I think this would make for the perfect treat on the weekends (lazy days). Yes, yes, and YES, Bri. I could (and do) eat coffee cake any time of the day and any day of the week. How have I not tried coffee cake before? This looks like it would be right up my alley! Oh, you simply MUST give this a try, Donna. I have a feeling you won’t be disappointed. I am going to print this to make the next time our friends visit from New York. It looks so incredibly moist, too. Carol Bryant recently posted..How Far Would You Go For Your Dog? I hope they love it, Carol. And it WAS so moist, which is one of the reasons I think I finally perfected it! You had me at healthy and then cake! This looks amazing! They are definitely a winning combination, Emily, even if it means eating more than one slice! I love coffee cake and have never made it, I am not a great baker. This sounds like I may be able to, I want to try it this weekend and the fact that it is so good for me- makes it even better! I’m not even close to being a great baker either, Carissa, but I promise this is SUPER simple! My kids actually love coffee cake, I’ll have to give this version a try. Sounds delicious! Your kids have GREAT taste, Tina, so I bet they would love this recipe. We love making homemade muffins ourselves too because to me they just taste so much better. This one looks amazing! Healthy coffee cake? You have my full attention! This sounds delicious and I will have to try making it soon! Thanks for the recipe! Tonya C recently posted..Wild About You Valentine’s Day Party Playdate! I love coffee cake! A healthy version of it sounds amazing and I must try it! I did it this morning for my family, really very delicious. I’m a forgetful person, so do just read your blog, but in the end complete a really delicious coffee.